As I mentioned in the first post of this series, the impetus for visiting Turkey was that a friend of mine had rented an apartment there for a couple of months and we wanted to take the opportunity to see the country up close. Although we spent the first several days in Izmir, my friend was actually staying in the port town of Kuşadası, which was about 45 minutes away. At one point he did try to come to Izmir and have dinner with us but the big city traffic was so nerve-wracking to him and he ended up going back to Kuşadası. I checked on the web and determined that the Pamukkale (Pam-OO-kuh-lay) Bus could take us to Kuşadası relatively cheaply. I looked at buying tickets online but since the website was in Turkish I didn’t want to agree to anything by accident so I asked the hotel’s front desk staff about buying tickets. They pointed out a Pamukkale office right across the street – perfect! We were able to buy tickets there and then hop on their shuttle bus that would take us to the main bus terminal. Once we were dropped off at the main bus terminal we obviously looked a little lost because we had several people point us to the correct place to board our bus. The bus had wi-fi and individual entertainment screens that featured videos (not sure if they were TV shows or movies, but they were in Turkish) and some games. It made the trip to Kuşadası quite enjoyable. By this time it was late morning and my friend met us at the bus terminal there. While we’d seen ruins just a couple of days before, he wanted to show us another site nearby that was a bit of a different experience. We stopped at one of the many open-air cafes for lunch and enjoyed fresh Turkish kebabs before heading the rest of the way to Priene. 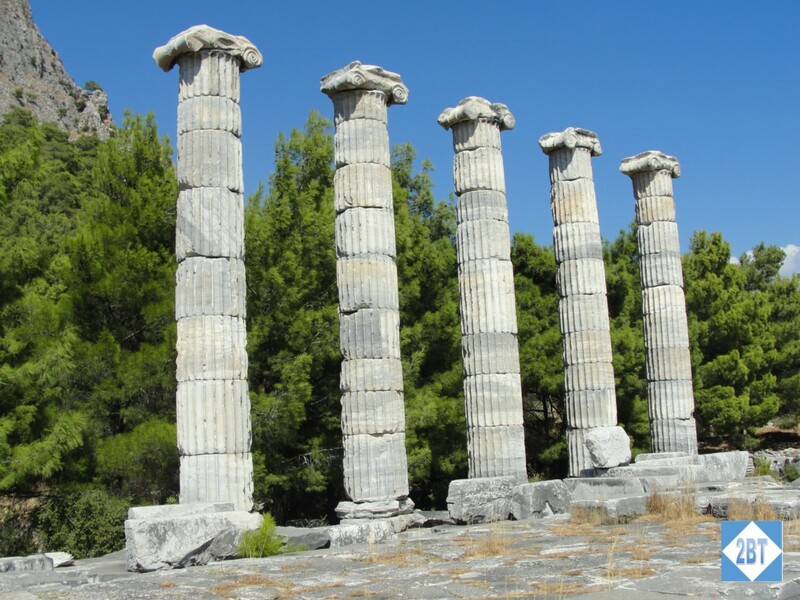 Priene was an ancient Greek site that was once on the sea coast. 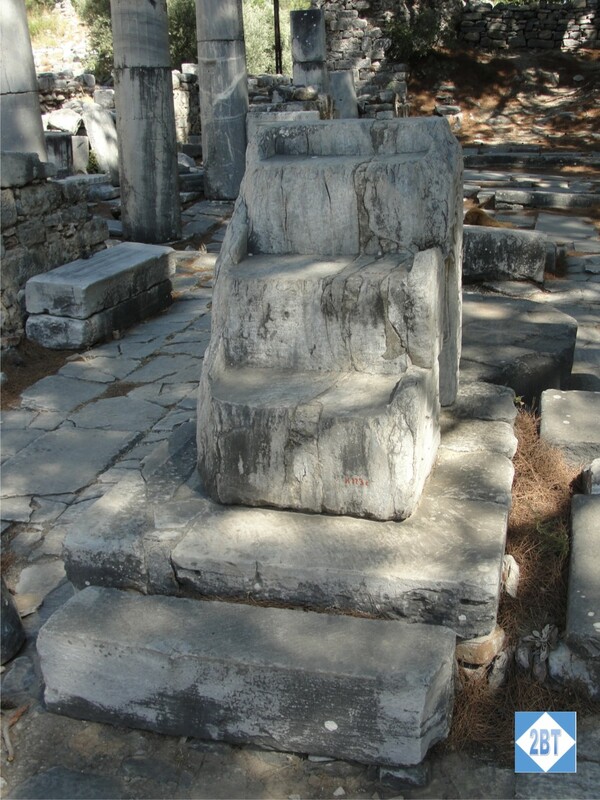 But as with Ephesus, time and earthquakes have taken their toll and now it’s now many miles inland. 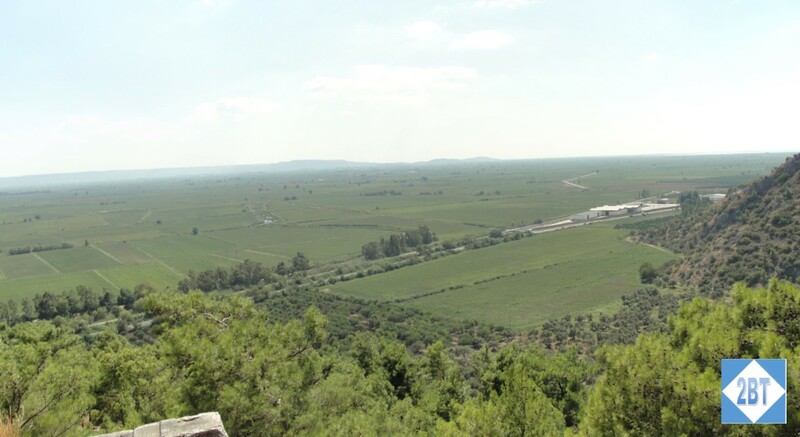 But it must have had a lovely view of the Bay of Miletus, off the Aegean Sea. 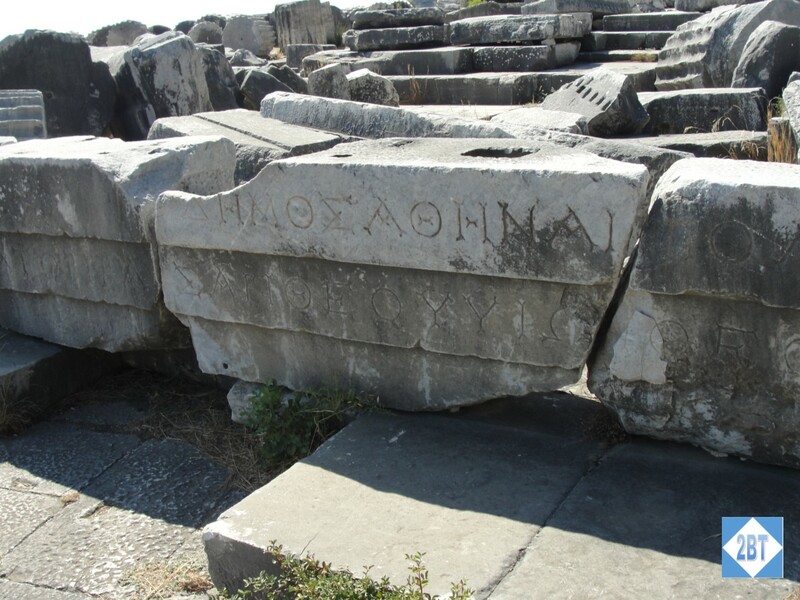 The remains of the agora are recognizable and the theater is still in relatively good shape. We found it interesting that there appeared to be seats for important persons right on the front row. 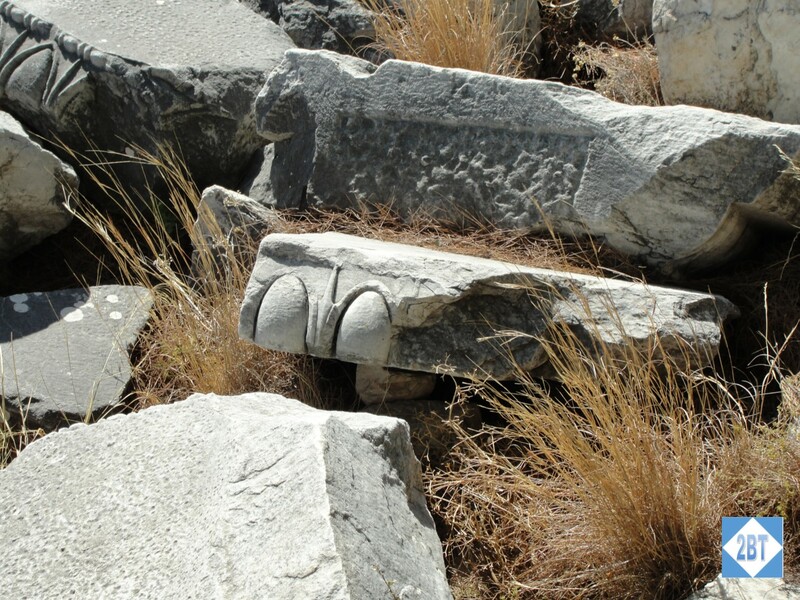 The remains of the temple of Athena (funded by Alexander the Great) are in abundance with pieces of pillars all around. Some pillars were reconstructed in the mid-1960s though it’s thought the original pillars were another 3 meters taller. Still, it helps to give us an idea of what the place might have looked like. What was nice about this historical site vs. Ephesus was that there were virtually no restrictions as to where we could venture. We could climb on these 2500-year-old ruins and run our hands over the carvings at will. It’s just amazing to think about how old some of these ruins are! 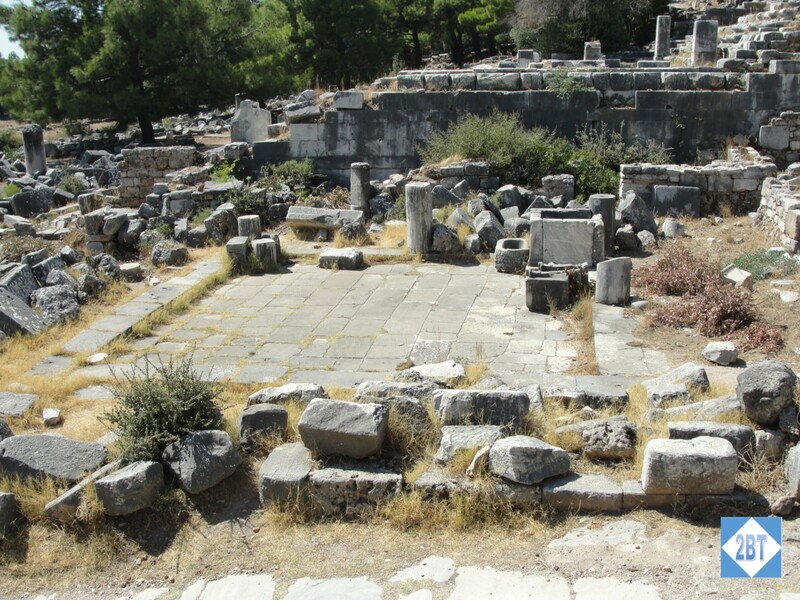 After leaving Priene my friend took us on a driving tour of Kuşadası before he took us back to the bus station. Getting back to Izmir was as easy as getting to Kuşadası. Getting from the main bus station back to our hotel was a little more challenging. We asked a couple of different people at the bus station where to catch the local Pamukkale bus. While they told us, we didn’t fully understand the instructions. Eventually we did find the location (right where they told us it would be!) only to find we’d missed the shuttle by about two minutes. So we sat around another half-hour for the next one. Not the end of the world but we were ready to get back to the hotel at that point. But we’d highly recommend the Pamukkale Bus as a clean, comfortable, affordable way to get around Turkey without having to rent a car. 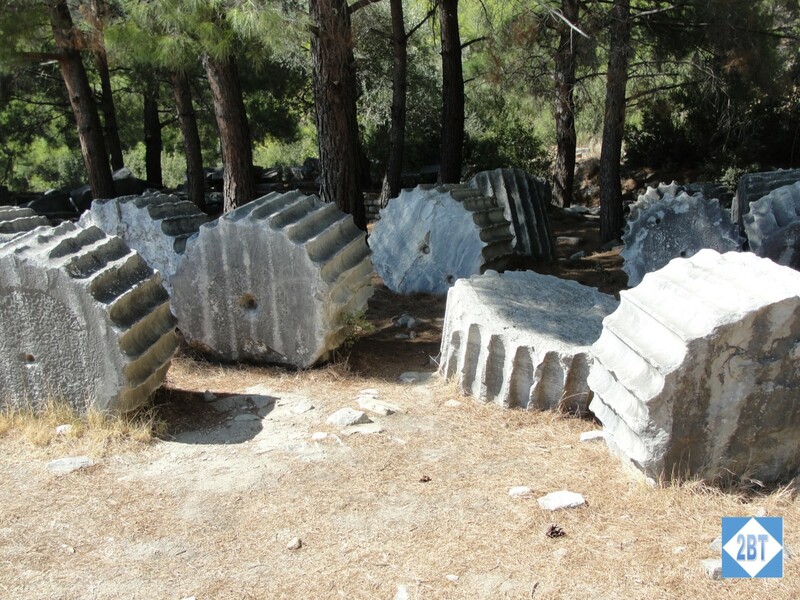 And Priene was a nice contrast to Ephesus – off the beaten path, no crowds and a definite hands-on experience.